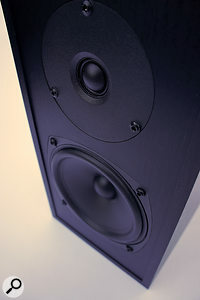 We've reviewed a couple of Graham Audio monitors in Sound On Sound in recent times and admired them both. The first was the Chartwell LS3/5, a reboot of the original and famous BBC LS3/5(A) compact monitor. The second was the Graham Audio LS6, a new design but one very much influenced by the traditions of classic BBC style monitor design. Graham Audio's specialism in BBC‑stye monitors is no great surprise, seeing as the designer behind the Graham speakers is Derek Hughes, son of BBC speaker engineer Spencer Hughes. The speaker in question here, the Graham Audio Swisstone LS3, is essentially the same size as the LS3/5, but the cabinet is turned through 90 degrees so that it is narrower and deeper. Graham Audio's expressed intention with the LS3 is to create a monitor that provides 90 percent of the performance of an LS3/5(A) at around 60 percent of the cost. The 'Swisstone' name chosen by Graham Audio for this speaker is a nod to the company of the same name, who owned the Rogers and Chartwell brands in the 1970s and 1980s. £600 per pair including VAT (plus £15 shipping). Approx $760 per pair excluding shipping.